Problem with the books by Rudel is....you don't have an overview what he is proposing in the chapters. About the Phoenix variation he has done an extra book. Do you need that one? festival wrote: Problem with the books by Rudel is....you don't have an overview what he is proposing in the chapters. About the Phoenix variation he has done an extra book. Do you need that one? Another in this series - The Moment of Zuke would be a welcome find. Most good chess games have turning points, decisive moves where momentum and advantage are at stake. The Moment of Zuke helps Colle System players succeed by illuminating the facets critical to these positions and providing plenty of practice material for training. 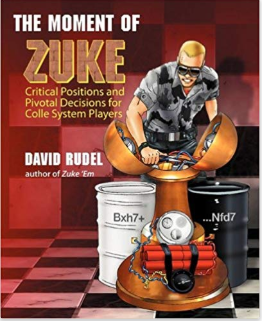 In June of 2008, David Rudel brought a new brand of chess instruction in his debut book, Zuke 'Em - The Colle-Zukertort Revolutionized. His original presentation and style speak to club, class, and improving players in ways not to be found in traditional chess books. The Moment of Zuke belongs in every Colle System player's library, containing seven lessons on common gamechanging situations Colle System players frequently see. Each module contains practice problems and solutions illustrating key attacking ideas for both b3- and c3-Colle System players. But not the op, Zuke 'Em.